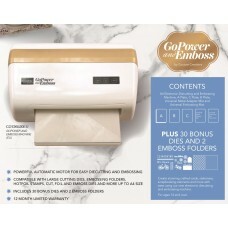 The GoPower and Emboss Machine includes a 12 Month Limited Warranty. How would you feel if your next craft project was already finished? Not free of imprecision or heart, but full of expectation and wonder, waiting to show off your family in the lounge room, pretending to be patient in an neat envelope, warming slowly in the morning sunshine. Imagine the light smiles and the spark of conversation in the air as you share just a little piece of your creativity, your joy and your life with the ones you love - this is why we developed the GoPower and Emboss. The GoPower and Emboss is powerful, not because you are weak but because you have clever, crafty fingers waiting for a worthy challenge. The GoPower and Emboss buzzes quietly and quickly, not because you are in a hurry, but because you love enjoying late nights in your craft room with the expectation of more wonderful adventures to come in the morning. The GoPower and Emboss comes with everything you need, not because you don't like leaving the house, but because groceries are for the necessities and craft stores are for the finding of new and delightful somethings. The GoPower and Emboss is universal, not because we think you will not love our products, but because the world is a magnificent place full of creativity and sometimes marvels wait in the unlikeliest of places. The GoPower and Emboss is coming soon, not because we wanted to wait, but because we wanted everything to be just right. 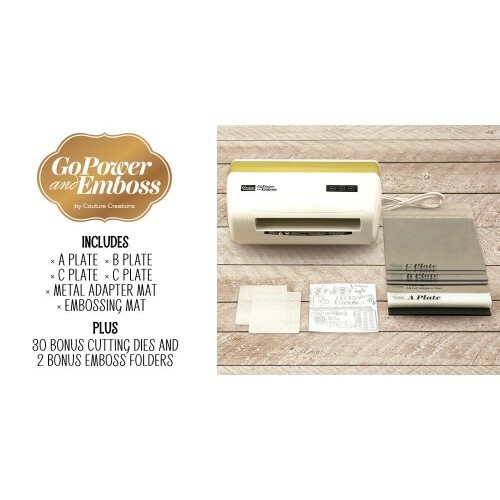 The GoPower and Emboss machine from Couture Creations is an electronic and multipurpose die cutting and embossing machine with a wide mouth and steadfast construction designed for use with all popular craft machine accessories and plates, including the GoPress and Foil Machine's Heating Platform. 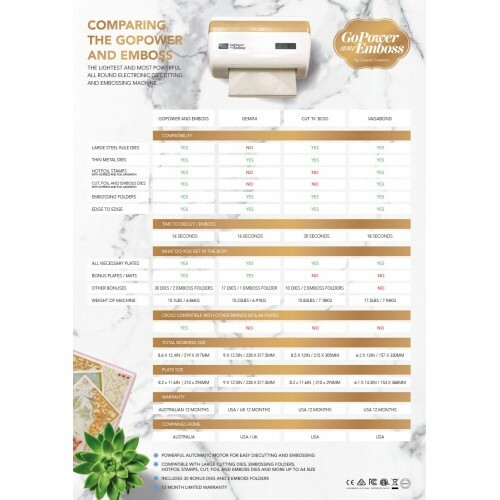 One touch is all you need and the Gopower and Emboss whispers into action, with a robust motor and powerful rollers our machine can apply an even pressure across plates as large as A4 Size (210 x 297mm) and as small as you dare. At launch the GoPower and Emboss has been accompanied by all of the plates you need to build sandwich compositions for all manner of cutting dies, cut, foil and emboss dies, hotfoil stamps, embossing folders and more PLUS 30 bonus cutting dies and 2 embossing folders designed for use in every season. 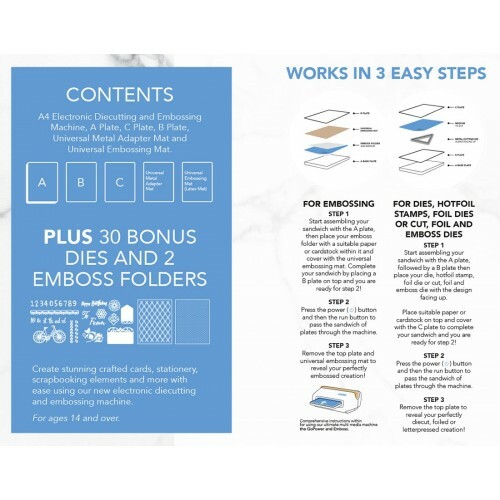 The GoPress and Foil machine is a fully patented concept for Letterpress, hotfoil, diecutting a..
Couture Creations GoCut and Emboss Machine is the popular Australian Die Cutting and Embossing ..
300 x 160 x 80mm | 11.8 x 6.2 x 3.1inThis great heat activated foil case features 16 all new hotfoil..
125mm x 5m | 4.9in x 16.4ftBrighten up your hot foiling projects with this brilliant set of hea..
300 x 160 x 80mm | 11.8 x 6.2 x 3.1inIncludes the 16 mouth watering heat activated foil colours belo..